Gujarat is one of the largest industrial hubs in western India. 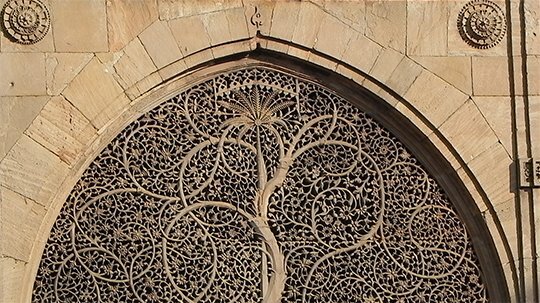 The city of Ahmedabad largely reflects Gujarat’s cuisines, cultural heritage, and economy. 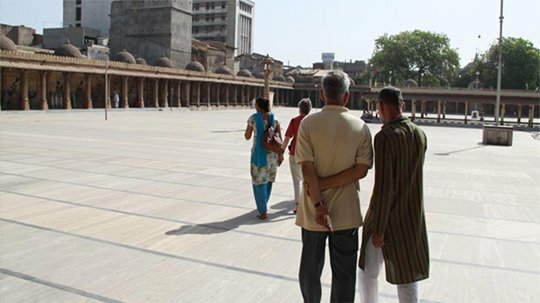 Take a look at the tourist spots spread across Ahmedabad, Gujarat. 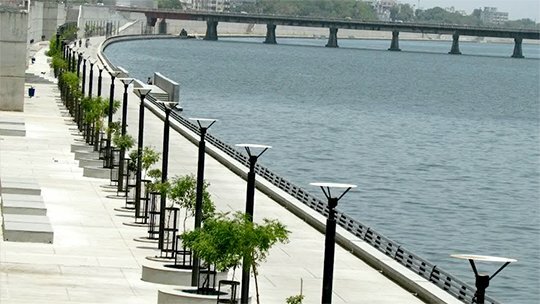 If you are in the city of Ahmedabad, Don’t miss out on visiting Sabarmati Riverfront. It is esplanade on both sides of River. It is perhaps the most divergent place in the city. Cycle riding, Water sports, boating, like fun elements make riverfront an ideal picnic spot. Many events held at Riverfront event center like cultural festivals, Award Functions, etc. 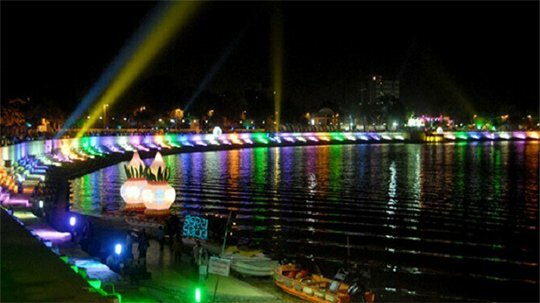 Even Riverfront Flower Park spread its fragrance to whole Ahmedabad. Riverfront is a good place to spend time with family and friends and unwind your mood. It is a vibrant and important focal point for the city. Timings: 9.00 AM to 9.00 PM. Kankariya Lake is the biggest lake in Ahmedabad. It is earlier known as Hauj-E-Kutub, and it was a bathing place for Badshahs. Nowadays it’s become center of attraction for people, having an island- garden in the center of the lake called ”Nagina Wadi”. There are many food corners and pathways across the lake. The museum, Zoo, Adventure Park, Garden, Aquarium are main tourist attraction places in Kankariya Lake. Timings: Except Monday, 4 am to 11 pm every day. No entry between 8 to 9 am and 10 to 11 pm. Cost: Free for all between morning 4 to 8 & Rs. 5 for kids below the age of 12 and Rs. 10 for everyone else. 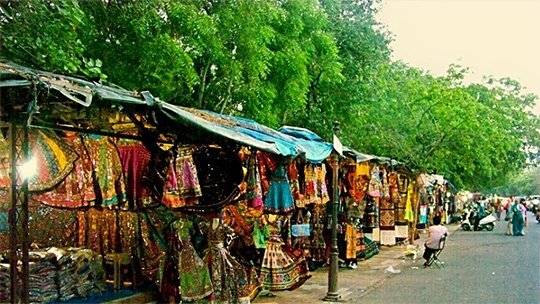 Enjoy street shopping at the Law Garden in Ahmedabad is a rare exotic experience. This is night market, more convenient flea market to every people. The night market is brightened with tube lights and it comes to bloom the evening with some additional oil lamps. It is a most prominent market with no permanent shops. During Navratri, People would love to shop traditional wear from the Law garden market area. Timings: After 5pm to 11pm. The Victoria garden is situated at the Bhadra Fort. This historical garden was built to honor Queen Victoria of England. It spreads the happiness of greenery, so spending time at there is one of the things to do in Ahmedabad. People come here to relax and revive in the natural beauty of surrounding greenery. The place with an exotic backdrop that would stun you. Timing: 8 to 11 am, 5 to 11 pm. 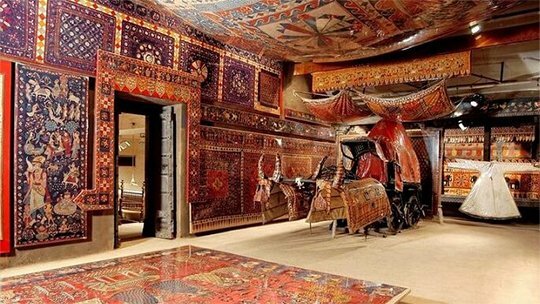 Calico is the finest and one of the foremost museums in the world, and it is also celebrated institute in the Indian Textile Industry. It has a collection of fabrics from across the country and exemplifies handicraft textiles spanning five centuries. It is designed in ethnic Gujarati Haveli Architecture. The textiles include court fibers used by Mughals, Regional Embroidery, Religious textiles which were collected to empower the textile heritage of India. Timings: 10:30 am to 12:30 pm and 2:30 pm to 5:30 pm on all days of the week, except Wednesdays. Entry is restricted after 11 am. Cost: Entry is restricted to 30 visitors. First 15 as personal and remaining as a part of a group booking. 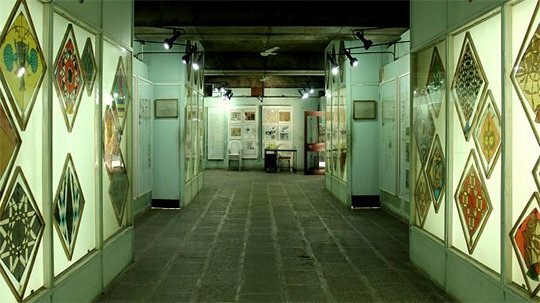 The Kite- Museum is established in 1985 with some rare collection of kites, it is an absolute delight for kite fliers. It has a collection of many different types of kites made and used across the globe. The collection of airplanes and evolution of kites will amaze you. This museum is a great place for kids to look at colorful and different varieties of kites. Timings: 10 am to 12 pm and 4 pm to 6 pm on all days, except Mondays. 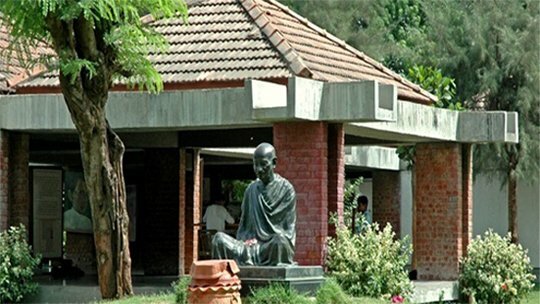 It is known as Gandhi Ashram or Satyagraha Ashram. It is located right on the banks of Sabarmati River in the suburb of Ahmedabad. It was made when Gandhi led the Dandi Salt March, so-called Satyagraha Ashram. It is declared the national monument by the government. It is the best example of peace and non-violence which Gandhi always wants. There is an “My life my message” gallery. Timings: 8:30 am to 6:30 pm all days of the week. 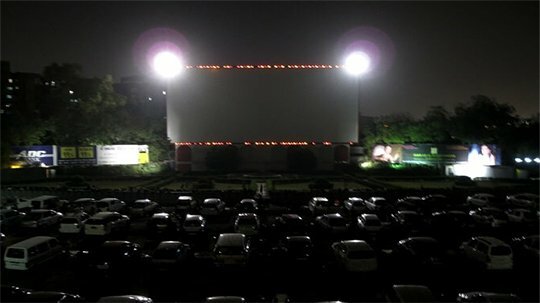 Under the open sky in the night, Experience to watch your favorite movie at the Sunset Drive-In Theatre in Ahmedabad is the great experience. If you want comfort in sitting and abandon your coach, go for a movie with fresh breeze blowing which unfolds your favorite scenes in front your eyes. You can even indulge in good food from their food court and take a stroll in the garden. It is the biggest open-air screen in Asia. Timings: Evening Show only on all days. Location: 50 to 60 INR. 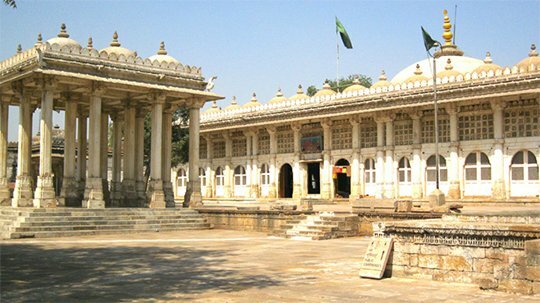 Sarkhej Roza is located at Makraba, 7 kilometers southwest of Ahmedabad. 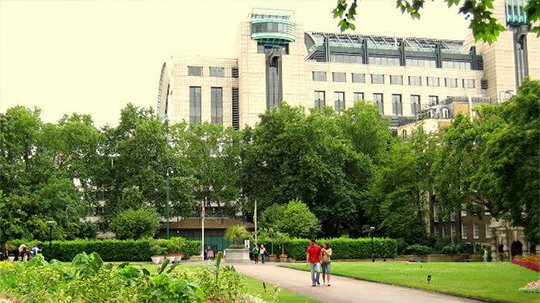 It has an elegant architectural structure in various buildings grouped. These include a mosque and a mausoleum. Sarkhej Roza was an eminent center of Sufi culture. Unlike other mosques, it does not have an arch-shaped entrance but a flat roof with 10 flat domes and 120 pillars instead. 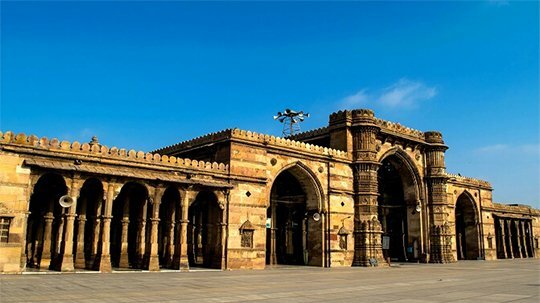 Sidi Saiyed Mosque is not only one of the most popular mosques in Ahmedabad, also one of the most ostentatious structures. It is built in the year 1573 by Sidi Saiyed. This mosque is little different from other mosques, screen carved out of single rock. It has semi-circular latticework windows that catch the eye of one and all. Timings: 7 am to 6 pm on all days of the week. Jhulta Minara is also known as the shaking Minara and it is a piece of the historic architecture. This was made by master craftsmen and its architecture is like, if one minaret is shaken then the other one starts to shake automatically. And it is the biggest mystery till now. If you are craft, architecture lover and you love to explore places, You should definitely go and enjoy. Cost: The entry is free for everyone. 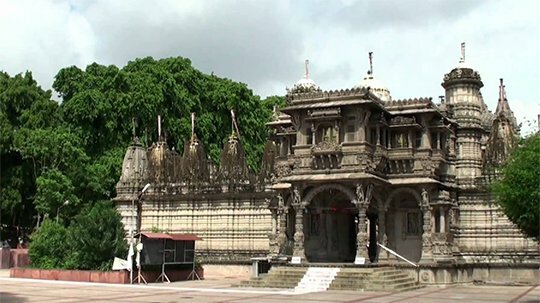 Shri Swaminarayan Temple is located at the Kalupur in the heart of Gujarat, Ahmedabad. It is the First Temple of the Swaminarayan in the world and is popular for the Heritage Walk. It is carved and designed in beautiful designs. The extravagant carvings and wooden section segment give people a good religious feeling. Timings: 7:30 am – 10:30 am. Cost: 50 for Indians & 100 for Foreigners. A Gulmohar Green is a golf and country club which impresses many people aesthetically. It’s green lawns, golf course and captivating interiors mesmerize you all. It is one of the largest resorts, having 75 acres land. 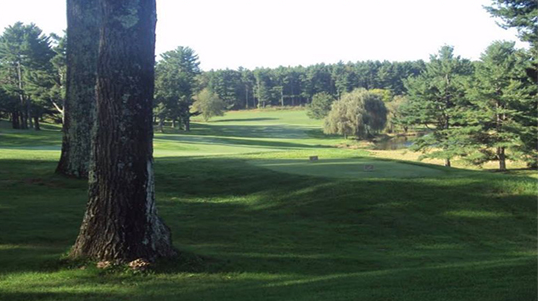 You can enjoy golf as well as relax on a weekend with your family and friends. Timings: 6:30 am to 11 pm. Cost: 1500 to 3000 per person. It is built by Sultan Ahmed Shah in the 1423 and is located in the heart of the city of Ahmedabad. Made of yellow sandstone and have mesmerizing architecture. It is a place where Ahmed Shah and rest of his family are buried. It is a unique blend of Hindu, Jain and Islamic designs and styles. There are a lot of bazaars across masjid. 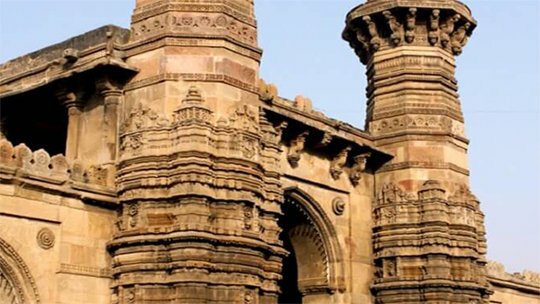 It is a one of the biggest tourist attraction of Ahmedabad. It is built in 1499 by Rudabai, located in the village of Adalaj. This is the stepwell and is boasting of Indo-Islamic architecture. Early it served as a place for relaxation for caravans and pilgrims thus villagers would visit to collect water and rest, and now it is a people attraction mostly in summer. The reason behind this is, the temperature inside the stepwell is apparently six degrees cooler than the outside. 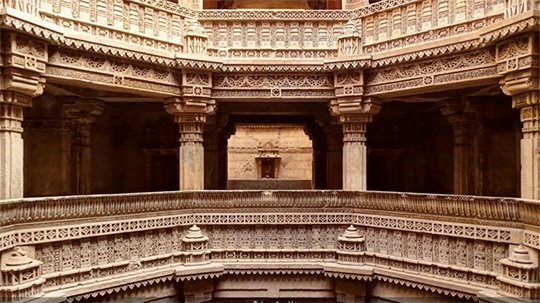 It is beautifully carved by Indian devotes and it has a unique feature to enter by stairs. Timings: 6 am to 6 pm all days. The Hathee Singh Temple is located in the center of the city, close to Ellis Bridge. It was built by a Jain merchant Seth Hathee Singh, dedicated to the 15th Jain Tirthankara called Dharmnath. It is one of the most splendid and is known for its spectacular architecture, style, and design and is built using beautiful white marble. This temple is the tiled courtyard with 52 shrines and it has a dome on the front porch. It is a must visit for all religiously inclined visitors. Timings: 5 am to 9 pm on all days of the week. It is located in Hebatpur and has an IMAX 3D theatre in this. There are life science park, musical fountain, and energy park in the Science city. 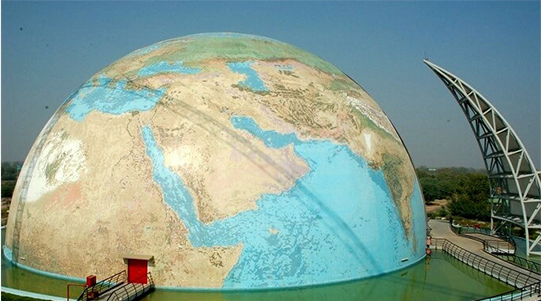 The Gujarat Science City is a great place for Science and Technology lovers. There is a full day engagement with science shows, programmes. Cost: Rs. 5 for kids and Rs. 10 for adults. If you are a car enthusiast, always dream about vintage car driving? Then Auto World Vintage Car Museum is the best place to visit. 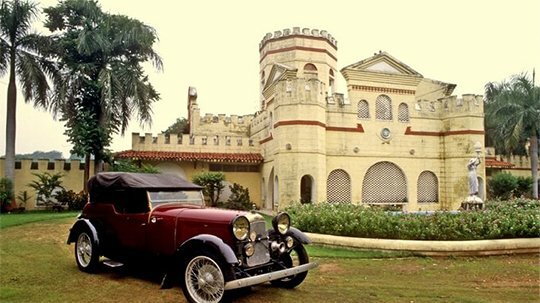 It is located 30 km from Ahmedabad, and have 115 vintage cars that are open for the public to drive with some cost. It is a delight to take a ride in the vintage car. The charges are Rs. 600 to drive your desired vintage car. Cost: Rs. 50 per person. Extra charge for taking a camera inside.